Recently, I was at a retail store grabbing a few last-minute things for Christmas. I checked off my yellow post-it in record time and headed to the registers. For the holidays, that particular store created “human corrals”. They cleverly funneled all shoppers into a chute leading up to the cashiers. Instinctively, I followed the herd and wound up wide-eyed and shuffling forward. Was someone mooing? The chutes were made up of shelf after shelf crammed with tempting, impulse-buys. I looked to the right and the left and wondered if anyone could use another pair of fuzzy socks. Not a bad idea to keep a small bag of trail mix in my purse. Maybe my daughter needs her own stain-remover stick for her backpack. That’s a good price on lip balm. By the time I unloaded my cart, the number of my purchases had doubled. Nervously, I chewed my spearmint cud and waited for my receipt. Thirty minutes later, I hauled bags and remorse through our front door. Another day of too much stuff. Another day of not enough self-control. Now might be a good time to mention that my word for 2016 was REACH. I hoped to reach past boundaries to expand my thinking, my community, and my faith. Sometimes, it worked. I reached past tired excuses and joined a gym. I reached for new people and perspectives. There were a few days I actually chose to reach past threatening bitterness and blame for more truth, joy, and love. In my marriage. At my work. With my own fragile soul. There were also plenty of failures. God gave me countless opportunities to reach out in faith; to see how big His gospel really is … and I often recoiled instead. I also reached for things I was never meant to have. Like control of other people. Like knowing everything. Like glory. Like another pair of fuzzy socks. That’s the thing about reaching. Sometimes we end up holding the hand of God. Sometimes we end up with forbidden fruit. It was good for me to reach more. But now I must practice something else. For 2017’s word, I’ve chosen ASK. How we wish Adam and Eve would have asked God before trusting the serpent’s lies. Lord, the serpent said, ‘You will not surely die.’ Is that true? Asking requires patience, trust, and listening. Asking requires humility. This past year, how I wish I would have asked God more before reaching, like at that store. How I wish I would have asked Him before recoiling in fear. I wish I would have asked other people more, too. For clarity. For help. For their story. 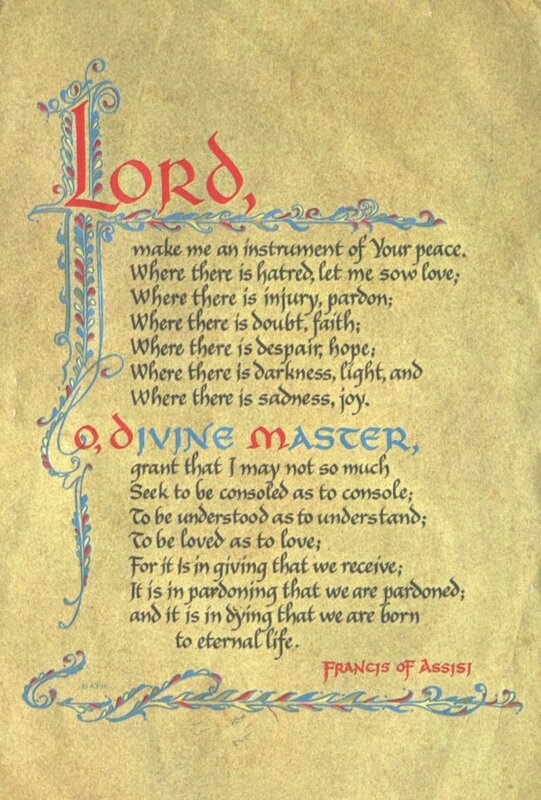 Throughout my childhood, my grandmother had the Peace Prayer of St. Francis hanging on her wall. I spent many hours reading those words and watching my granny live them. It’s become the psalm of my life. The whole prayer is about bringing Shalom to a broken world. It’s one great, poetic ask for more wisdom, more humility, and more of God Himself. It’s a prayer for before the reaching. I can’t quit reaching, but this year will be about asking first. Can I begin by asking you? What’s your story? What’s keeping you from Shalom? Linking up with Holly Barrett for Testimony Tuesday. It’s fun! Karen, I love coming here because I come away having heard whatever God is saying to you at the time. Thanks for letting us eavesdrop for a bit! Michele- Thank you so much for stopping by! Happy New Year! Karen, I love your word for last year, and especially for this year. I also love the transparency of your post. I’ve also been one to reach for things I shouldn’t or I don’t need. And asking? Yes, that will also be something I’m doing this year. Asking for God’s help and His perspective as I learn how to live intentionally. I look forward to reading more about what you learn about this word! Jeanne- thanks for the encouraging words. Happy New Year! Love this. Asking requires a certain vulnerability, too. I’m always surprised when I’m hesitant to ask God for or about something. Shouldn’t I feel most comfortable in my vulnerability with him? Looking forward to reading where this word takes you!